Thank you Helen Gym for writing "Reformers, please listen to what parents want for schools"
Helen Gym wrote a beautiful article today about school reforms from a parents point of view! We love seeing passionate parents find a voice and the energy to engage with schools and administrations and teachers to make the quality of education great!! And in our hometown of Philadelphia!! Go Helen go! CNN Editor's note: Helen Gym is a Philadelphia public school parent and writer and founder of Parents United for Public Education, which seeks classroom-centered investments in education budgets. She is a board member of the Philadelphia Public School Notebook, where she contributes online commentary. She helped found the Folk Arts-Cultural Treasures Charter School in Philadelphia Chinatown and was named the Philadelphia Inquirer Citizen of the Year for 2007 for education activism. Here's what I can tell you about my daughter's education. I can tell you the name of the history teacher who inspired her this year, the book that she loved and couldn't stop talking about and the topic of the reflective essay she labored to write and rewrite. I can tell you which teachers gave homework assignments that made some of our family evenings perfectly miserable and the community service projects that had our whole family out cleaning the streets or readying a garden. I can tell you what it felt like when the principal of a school shrugged her shoulders after I complained my daughter had been pushed down the stairs (we left that school) and what it felt like when the new principal stood outside greeting children by name as they entered every morning. I can tell you that my mother cried when my youngest daughter's school choir sang "Arirang," a traditional Korean song, and that I loved every squeak and clank of the school orchestra. I can tell you all of these things because as a parent, the true meaning of a quality school lies in a strong child- and family-centered educational mission that recognizes education as a "process of living" and school life as "real and vital" to our children and families, as American philosopher John Dewey wrote more than half a century ago. What is the circumference???? Today is National Doughnut Day! National Doughnut Day is on the first Friday of June each year, succeeding the Donut Day event created by the Salvation Army in 1938 to honor the women who served doughnuts to soldiers during World War I. The holiday celebrates the doughnut (a.k.a "donut") — an edible, torus-shaped piece of dough which is deep-fried and sweetened. Many American doughnut stores offer free doughnuts on National Doughnut Day. How about you take your kids and measure the circumference of the Donut? Both the inner and outer rings? Can they guess which ones weigh more? Are more dense? See this article about architecture and teaching math in the Desmoines Register! Thanks to our fans for alerting us to this! Math Anxiety...brain research is telling! Math problems make more than a few students — and even teachers — sweat, but new brain research is providing insights into the earliest causes of the anxiety so often associated with mathematics. Eugene A. Geist, an associate professor at Ohio University and the author of “Children Are Born Mathematicians,” works with math teachers to create “anxiety-free classrooms” for students. He advises teachers to have students focus on learning mathematics processes, rather than relying on the answer keys in a textbook, which can undermine both their own and the teacher’s confidence in their math skills. 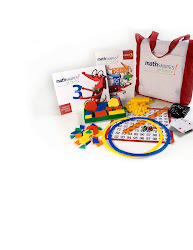 Here you will find thoughts and ideas about math to inspire you to Go Figure! Copyright ©2009 Mathematically Speaking, Inc.. Simple theme. Theme images by chuwy. Powered by Blogger.